The trip commences on the morning of Thursday the 25 July at 08:00 at the Windhoek Country Club Hotel. Total price – Single N$ 5970 – Sharing (2 people) N$ 10100. Includes all meals, entry fees into the National Parks, additional 4X4 transport to Sossusvlei, and full board at the hotels. 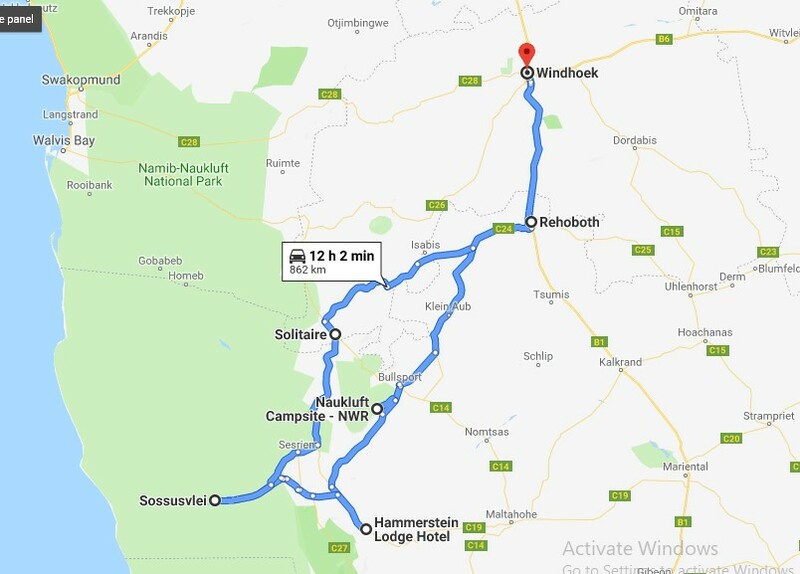 At the Windhoek Country Club Hotel the southern route will follow towards the small town of Rehoboth where just after there will be a short stop at the Oanob Dam. From there we will continue south-west towards the escarpment where we will encounter the Naukluft Dolomites that is part of a Nappe Complex at the edge of the escarpment. We will make a stop at the Naukluft mineral water bottling plant. From there we will continue down the escarpment where we fringe into the edge of the Namib Desert. We will reach the Hammerstein Lodge where we will overnight. One should be able to see some of the typical wild animals of the area that include the mountain zebras, oryx, springbok, and ostriches. At the lodge both leopard and cheetah are kept in captivity and they can be visited. Early during Friday morning we will depart for Sossusvlei that represents a wetland in the Namib at the end of the Tsauchab Ephemeral River. We will be taken by 4X4 to the Sossusvlei and Deadvlei. We will also look at the Sesriem Canyon, where after we will drive to Solitaire, where we will overnight at the Solitaire Lodge. Early the next morning we will return to Windhoek, up the famous Remhoogte Pass. We should be back in Windhoek during early afternoon of Saturday the 27 July.